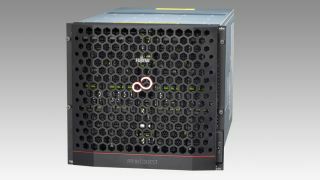 Fujitsu has launched a new mission-critical x86 server range that boasts processing performance up to 2.5 times that of previous models. The Primequest 2000 series features the Intel Xeon Processor E7 v2 family of CPUs, with scalability up to 120 cores and up to 12TB of memory. There are five models available, including the entry-level 2400S, with up to four processors, or the 2800E enterprise model, which allows up to eight CPUs. Long-life models with up to 10 years maintenance are also available. Fujitsu boasts that the 2800E in particular has achieved the highest performance rating on three major industry benchmarks, including SPEC CPU2006 and VMmark V2. The servers come with multi-OS platform support, including the option to run Windows Server, Linux, or Fujitsu's own Software OSIV/XSP operating system. The machines pack mainframe-class reliability and availability, including a built-in auxiliary system board for autonomous system restarts in the event of a system failure. The Primequest range launches on 30 April, with prices ranging from 3.6 million Japanese Yen (£21,000, US$35,500, AU$37,500) to 17.6 million Japanese Yen (£105,000, US$173,500, AU$185,000). Fujitsu hopes to shift 2,500 units worlwide by the end of March 2017.